Mario Draghi used the word “rule” seven times in his recent press conference following the meeting of the European Central Bank's Governing Council in Nicosia. Six of those references were related to questions about Greece. Two times when he was asked about the ceiling on the amount for T-Bills Greek banks are allowed to hold, one time on Greece's participation in the quantitative easing programme, two times on the Emergency Liquidity Assistance (ELA) that Greek banks resorted to after the ECB stopped accepting Greek government securities as collateral, and one time in respect to the decision on the Greek waiver decision. The ECB chief must have anticipated that Greece would take up a good chunk of his press conference but he found it hard to mask his irritation each time the Greek issue was raised. He even went to the length of outlining that the ECB is also Greece's central bank, having supplied over 100 billion euros to the country’s lenders, which corresponds to 68% of the Greek economy, the highest percentage in the eurozone. The ECB finds itself in an awkward position being the major component in the coordinated effort recently described by a eurozone official in which "the liquidity squeeze is being used to push the Greeks to very quickly start discussions on the review and finish that as soon as possible - not even waiting for the end of April." The ECB is drip feeding Greek banks with liquidity via the ELA provided by Bank of Greece, and with the cap on T-bills issuance as well as the threshold of those that it accepts as ELA collateral is the ultimate conditionality enforcer. Reports indicated that at the recent Eurogroup meeting, when Greece and its lenders reached a preliminary agreement to avoid a full on collision, the ECB warned that a failure to reach a conclusion would mean that banks might not be able to reopen after the long weekend and capital controls would have to be imposed to keep the banking system afloat as no more liquidity would flow from Frankfurt. It is not the first time during the euro crisis that the ECB has played the role of the bad cop. However, is it really as much of a rule-based institution as Draghi attempted to convey a few days ago and is the prohibition of monetary financing, direct or indirect, as much of an unbending principle as he emphasised? During the past few years there have been a number of ECB decisions that suggest Draghi is only telling part of the story. At least, these events suggest that the rules are not carved on stone and there is a lot of room for interpretation and flexibility on the ECB’s part, if the bank so wishes. The Irish “promissory notes”, the Long-Term Refinancing Operation (LTRO) at the end of 2011 and early 2012 and Greece in the summer of 2012 constitute three cases that challenge Draghi’s “rules” argument. For a much more detailed explanation of the promissory deal you should read this piece from Karl Whelan. The summary of it is that Irish Bank Resolution Corporation (IBRC) was created from merging two institutions that had borrowed money under the ELA from the Central Bank of Ireland to pay off their creditors. The Irish government provided guarantees to the Central Bank of Ireland that these loans to the state-owned IBRC would be repaid. It also agreed in 2010 to provide it with promissory notes. These notes provided the Irish Central Bank with payments of 3.1 billion euros per year over the next decade from the Irish government, which is about 2 percent of Ireland's GDP each year. When IBRC was liquidated, the promissory notes were not taken on by the Central Bank of Ireland. Instead, they were swapped with 25 billion euros in new bonds. The new bonds have an average maturity of around 35 years, ranging from 27 to 40 years and an interest of 6 months Euribor plus 263 basis points coupon. Under the promissory notes arrangement the Irish budget would be hit for a decade with a net annual payment to the central bank of 2.5 billion euros - 3.1 billion gross minus the profits that the central bank returns to state. The terms of the swap involving the long dated bonds mean the annual payment does not exceed 1.4 billion euros annually, a significant relief of more than 10 billion euros over the 10-year period. The promissory notes arrangement had a net present value (NPV) of 19.5 billion euros, whereas the new bonds have a value of 12.8 billion euros in NPV terms (based on a 6 percent discount factor detailed in a spreadsheet used by Whelan). This is a reduction in NPV of more than 34 percent, which may not be an outright haircut but certainly results in a greatly reduced burden. A state obligation to the central bank of Ireland that is under the jurisdiction and oversight of the ECB was swapped, leading to a relief of over 10 billion euros on the budget in the first ten years and effectively a haircut in the claims. Within the euro framework, this is an absolutely sensible deal between the Irish government and central banks as it reduced both fiscal pressure and debt issuance needs, to a large extent securing Ireland's exit from the EU/IMF program. At the same time this deal could be part of the definition of indirect monetary financing. 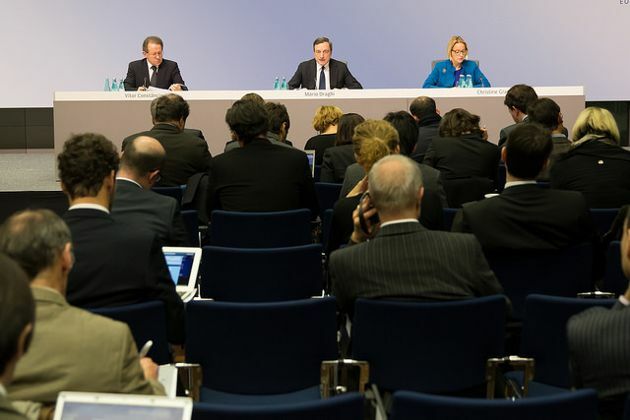 The ECB's reaction at the time was limited to that of passive observer. In last year's annual report it acknowledged that the process did indeed border on monetary financing but the flexibility for officials in Frankfurt with the necessary legal alibi will be provided by the disposal schedule of those bonds to the private sector by the Irish Central Bank. At a critical moment for Ireland, the ECB chose to look the other way. Draghi reiterated in his press conference on Friday the definition of indirect monetary financing: "Monetary financing is when the central bank of a country prints money to buy the government bonds in the primary market of that country, and it could be either direct or indirect, when banks bring collateral to the ECB in order to be financed in order to buy the sovereign debt of that country, and we are prohibited from doing that." The 3-year LTRO that was introduced in the end of 2011 is probably the closest to this exact definition. It is known as the Sarko trade, after the then French President Nicolas Sarkozy openly told reporters at a Brussels summit: "This means that each state can turn to its banks, which will have liquidity at their disposal," to buy sovereign bonds. Initially the LTRO was presented as a financing window to support bank lending and money market activity but in effect was a fire fighting exercise to keep Italian and Spanish sovereign debt yields in check and ensure participation in new issues in the pre-"whatever it takes" crisis management era and in the absence of Outright Monetary Transactions (OMT). Just one week after the announcement - and before the LTRO window opened on December 20 in 2011 - Spain issued a 2020 bond with a yield of 5.2 percent. While the Spanish government was looking for 3.5 billion euros, it ended up collecting 6 billion. The 3-year LTRO never stimulated lending and the liquidity did not reach the real economy as had been intended, or at least presented. But it certainly increased the participation of local banks to the debt of their sovereign. In desperate times the rules can be bent, it seems. There is a case that is even more relevant to Greece and its current liquidity predicament. In the summer of 2012, then Prime Minister Antonis Samaras had just formed his government and started negotiations with the troika for his first review as the Greek leader. It was anticipated that the disbursements related to the review would not be coming any time soon but on August 20, 3.1 billion euros of Eurosytem holdings were due to mature. Had Greece failed to meet the obligation, Samaras would start his tenure with a default. In July that summer the ELA to Greek banks stood at 106.3 billion euros but since defaulting on the ECB was not an option the maturing debt was covered via the issuance of T-Bills with the sole participation of the Greek banks after the ECB did not object to raising the limit. The rule here seems to be, comply with conditionality and we will work something out, challenge it at your own risk. If rules were rigidly followed, the Irish would still be unnecessarily paying their central bank 2.4 billion euros each year, Spain and Italy would have issued much more expensive debt at the end of 2011 and the first half of 2012, while Greece would have been looking for creative solutions to find cash and avoid a default in the same year that it had completed its private sector debt restructuring. In reality, it is not about rules, or not just about rules, it is also about intentions. At the moment the intention with respect to Greece seems to be that it should be made an example of and put under as much pressure as possible. The ECB is spearheading the effort. The view of the author does not convince me. And even if the ECB would use more strict rules now towards Greece, nothing useful can be done against that within the short time frame available. Tsipras already has agreed to have the troika in the house real soon. This imho is the 2nd defeat within a few weeks. No doubt this one too will be sold to the voters as a victory because Troika is now called the "institutions". If as you say this is the 2nd defeat already then this government can not survive. So, let's call elections again and see if this government is replaced or strengthened. The reason that no Greek government could cooperate with Berlin is that such would mean sudden death. That's why all previous governments fell. Because they cooperated and as a result destroyed. @Dean Plassaras: Wrong again. You know for a very long time that in new elections you will be elected PM! Your view of the world is too distorted. Every Greek government post 2010 cooperating with Berlin got destroyed. Papandreou fell, Papademos replaced, Samaras, Venizelos and Kouvelis all fell as a result of excessive wear and tear. PASOK went from 45% down to 2.8% today. ND from 40+% down to 17%. DEMAR was blown to pieces. LAOS and Karatzaferis all destroyed. I don't get your reasoning. Let's say we all play the bureaucratic game and as a result this government falls. We then have new elections and the same government gets re-elected with an even higher margin. What't the purpose of playing the rules' game?